This book was recommended to me by one of the physicians I work with quite some time ago. One of my blog friends gave it one star and another co-worker said it was "okay", so I have been putting it off. I needed an audio book and this was available, so I downloaded it. This book was well outside my comfort zone, but it was a thought provoking story. It is a fictional story about two British journalists, Sarah and Andrew O'Rourke, who travel to Nigeria on vacation. At the time, there are oil wars going on and there is a lot of violence in the area. They venture outside of their hotel compound and encounter two Nigerian girls and some "soldiers" for lack of a better term. The journalists return to England, but the events that took place in Nigeria have irreparably altered them. The story is told from both Sarah and Little Bee's point of view. 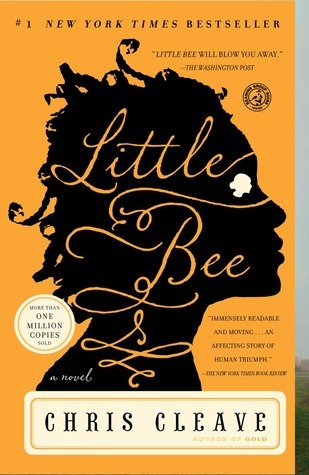 (Little Bee is one of the Nigerian girls.) When we are first introduced to Little Bee she is in a British Immigration Detention center. She fled Nigeria after the encounter with the journalists for her own safety and is seeking refuge from Great Britain. Sarah and Little Bee's world eventually collide and their story unfolds in this novel. Overall, I thought this book was okay. I debated between giving it 2 or 3 stars and settled on 3 because it is well written and I can appreciate the author's message about immigration. The story just wasn't my cup of tea. It portrays fear and terror and contains a lot of violence. The ending was also left open, which I don't usually care for. In this case, the reader can put two and two together to interpret what happens, but the ending is very depressing. That is probably why the author did not include the additional few pages it would have taken to tie up the loose ends.